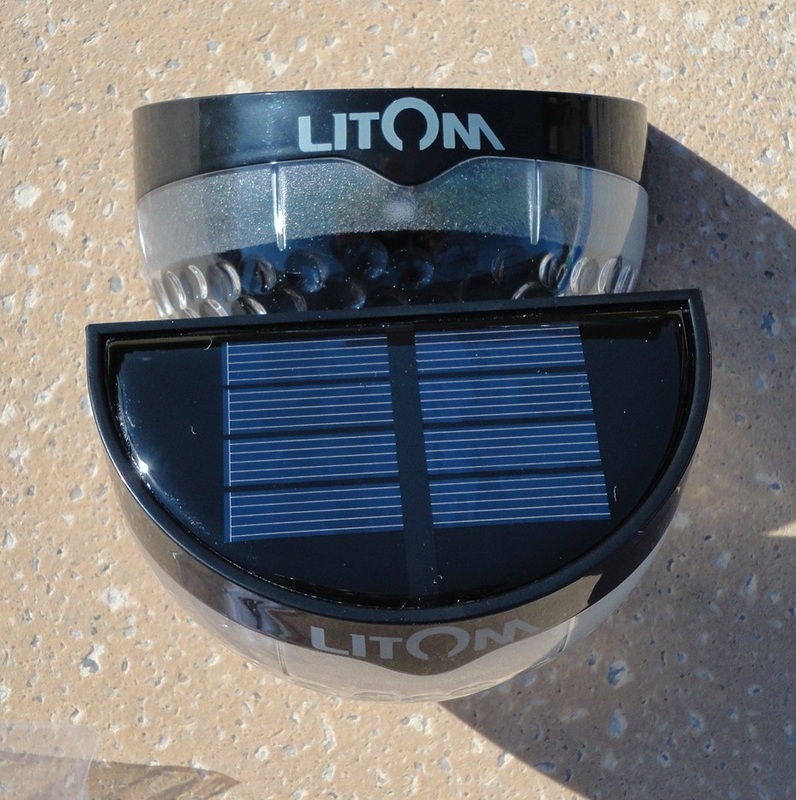 These solar lamps are very different from the ones I have come across so far. First of all they are quite small, like half a grapefruit; secondly, they cast a very pretty, refracted light through a textured plexiglass-type half dome. The light switches on once it gets dark and stays on continuously until the battery charge is used up, so a sunny location is essential to get the most out of them. They do not have a motion sensor, only a light sensor. 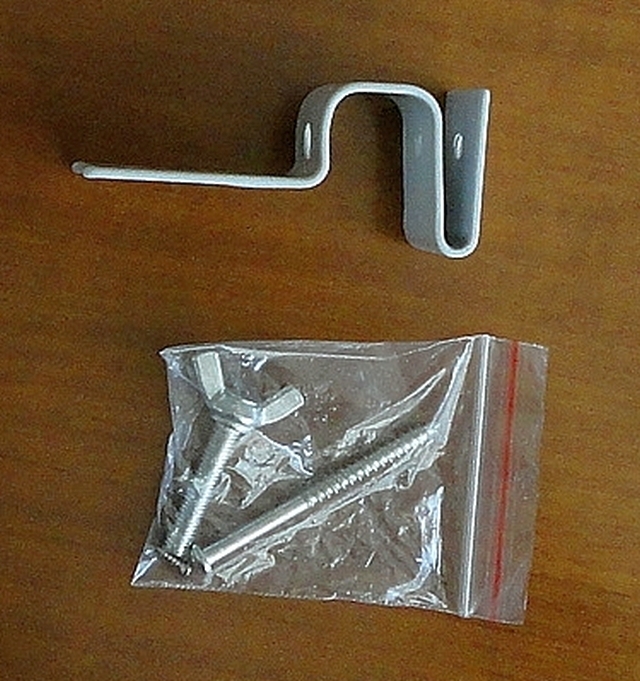 The mounting hardware is included: 4 screws and 4 wall plugs, together with an illustrated and fairly clear set of instructions. The battery is locked for transport, and needs to be turned on by removing the plastic dome (you can lever the little notch at the bottom with a small screwdriver) and pushing down on the On/Off button inside. 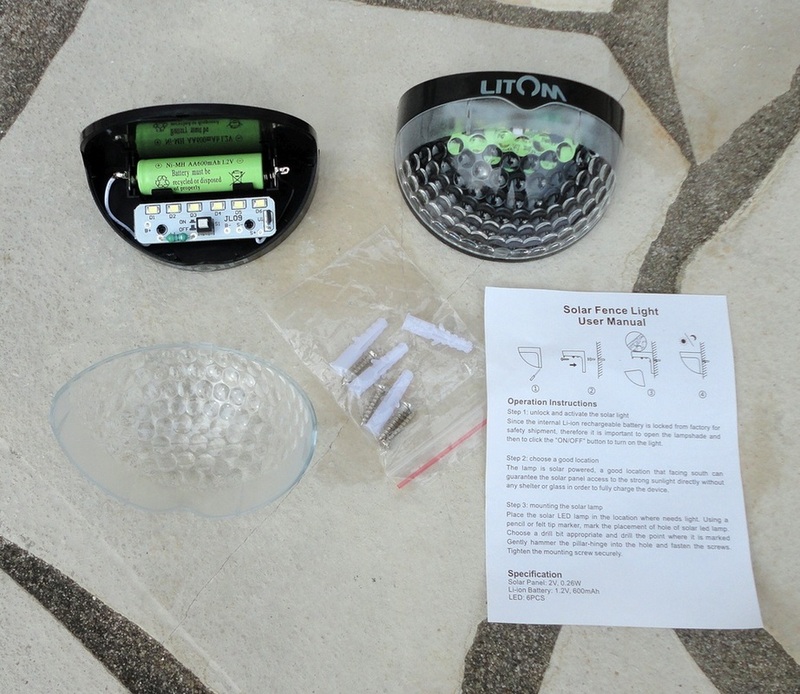 While you have the lamp open, you might want to check that the battery is well seated (mine had moved) and proceed with the installation using the screws mentioned before. Once the plastic shade is back in place, the lamp is ready to work at nightfall. The hidden mounting makes these a little harder to steal, which might be a consideration for some. I really like the effect in the dark. 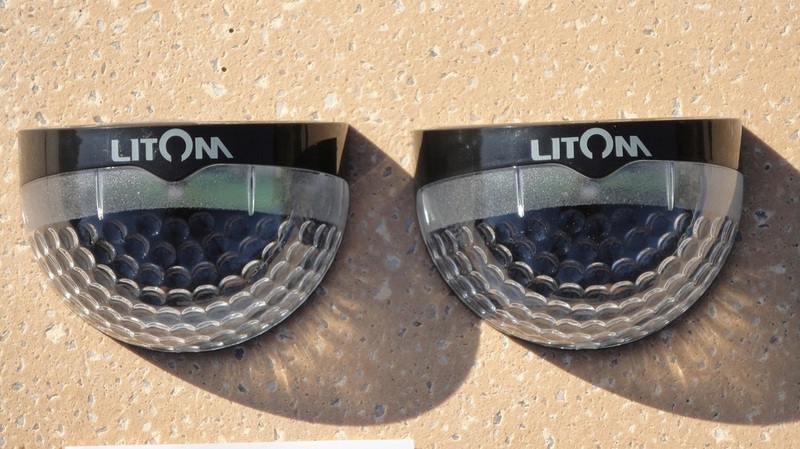 These lamps cast a fairly strong white light, thanks to 6 LED spots, which gets broadcast quite widely. They look great when a number of them is mounted around a fence, along railings or to highlight steps, which is easy to do as they come in packs of 2 and 4. But even just a couple flanking a door produces a beautiful effect at night. We haven't had a lot of sunlight lately but one night I got up and saw that they were still lit at 3 am (and who knows how much longer), so they have a useful duration. 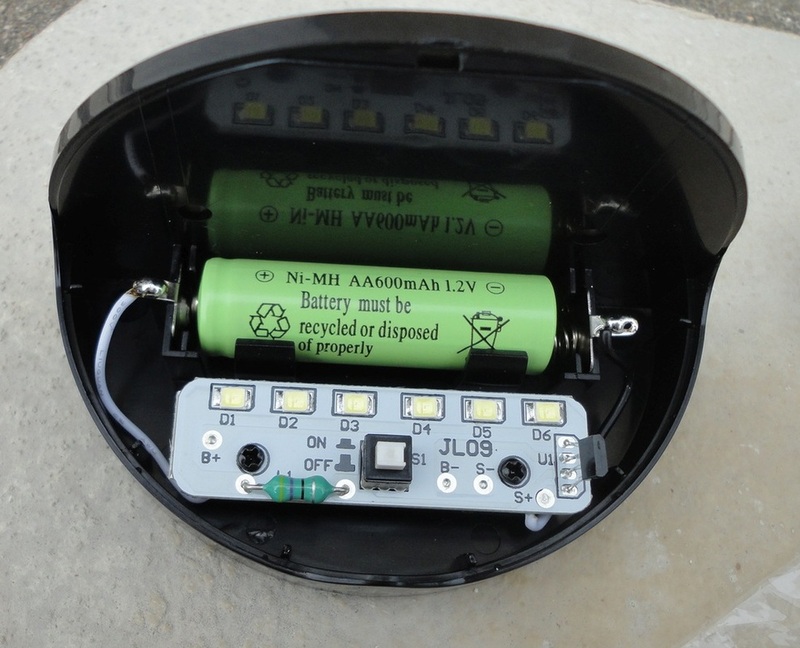 This small but atmospheric solar-powered LED light fixture is quite different from many others I have reviewed. 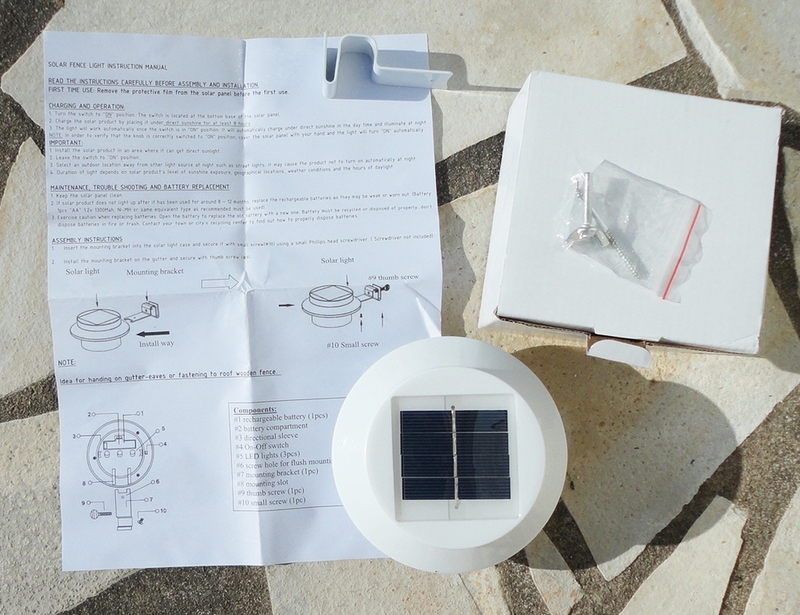 I received this unit for testing in early autumn, and it was great to see that it charged fully with only 6 hours of sunshine (the instructions say at least 8 hours are needed). I'm sure the subsequent days topped up the charge but the lamp was operational the very first night and lasted until early morning. 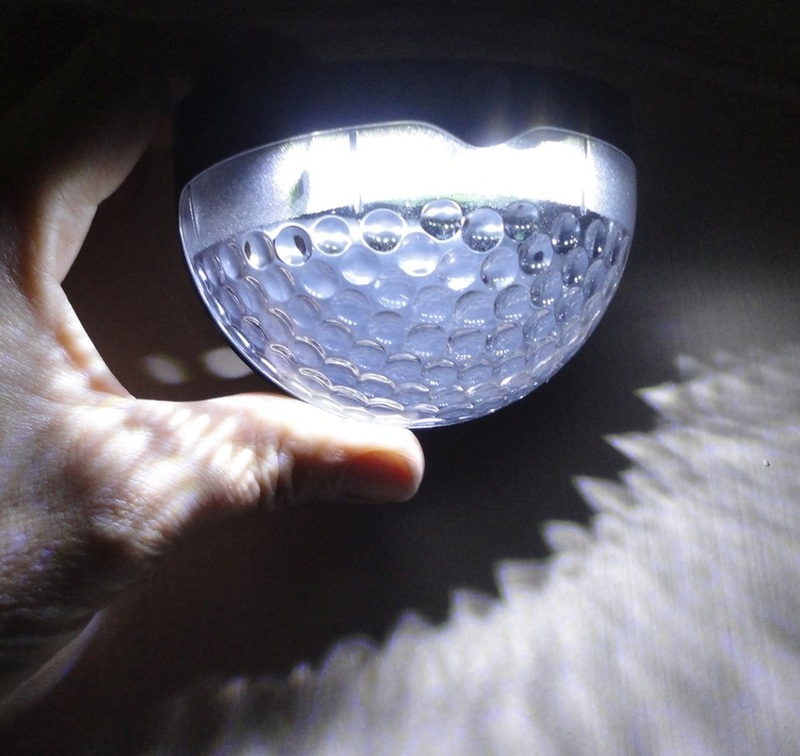 Physically it is quite a small unit (about 5 inches across and 2 ½ inches in depth) and very lightweight with 3 LED bulbs. It is designed to clip onto an average gutter and comes with an appropriately-shaped metal clip, a thumb screw with wingnut, a small screw and, in my package, a long mounting screw as well. The instructions are made clearer by diagrams and are easy to follow. The cone of light is fairly narrow and concentrated, it is intensely blue and looks wonderful at night. This lamp is sold singly but also in multiples, up to 5 in a pack. I think it looks prettiest when there are several, for example, around a terrace or along a fence line. The main consideration, as usual with solar units, is to select a sunny location.